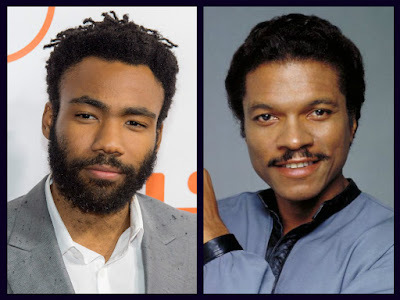 The upcoming Han Solo film already has its lead in Alden Ehrenreich but more importantly who is going to take the role made famous by Billy Dee Williams, Lando Calrissian? Lucasfilm announced Friday that actor, writer, producer, director, comedian, rapper and creator of FX's hit series 'Atlanta' Donald Glover has been chosen to play the smooth intergalactic smuggler. Glover created and stars in the critically acclaimed series Atlanta that had the highest premiere numbers for any basic cable comedy show since 2013. He's also known for his role on NBC's cult series 'Community' as Troy Barnes for four seasons. The multi-talented performer also performs under the name Childish Gambino whose album Because the Internet was nominated for a Grammy. He'll be seen in the upcoming Spider-Man: Homecoming film for Sony/Marvel Studios. The untitled Han Solo film is scheduled for release in 2018.